The friction material is one of the most important parts of the brake, especially because it determines braking ability. Before being sold, these products must pass exhaustive testing for performance and durability. For brake components such tests are extremely demanding and include evidence of wear, vibration and resistance to high pressures and temperatures. 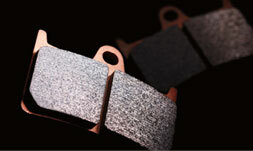 Safety is not an option, only Genuine Yamaha brake pad and brake shoe parts can maintain product quality. Authorized Yamaha dealers are trained to provide all necessary information and advice on spare or replacement parts. Only original parts maintain the reliability of your Yamaha.